To celebrate the success of Bourbon & Beyond‘s inaugural year, Danny Wimmer Presents has announced a special Early Bird ticket sale now underway for Bourbon & Beyond 2018. A limited number of General Admission Weekend passes are available for $119.50 (matching 2017’s lowest price). To purchase tickets, visit: https://goo.gl/fg1KoW. Hotel and camping options are also available at www.BourbonAndBeyond.com. 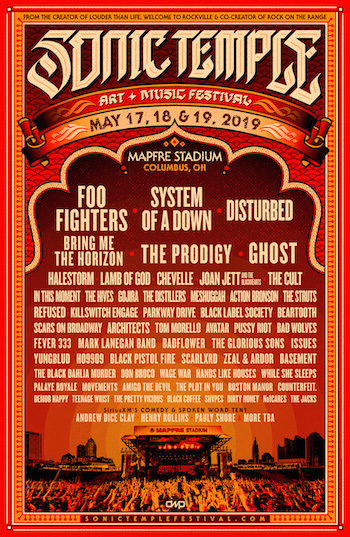 The fourth annual Louder Than Life marked the festival’s biggest year yet, solidifying its standing as one of America’s premier destination music festivals. Louder Than Life 2017 drew 60,000 fans to Champions Park to witness headlining performances from Ozzy Osbourne featuring Zakk Wylde on Saturday and Prophets Of Rage on Sunday, plus Five Finger Death Punch, Incubus — returning to Louisville for the first time in over a decade — Rob Zombie, Stone Sour, Rise Against, and nearly 30 other bands on three stages.